Corian® countertops are one of the most useful and adaptable countertops on the market. Corian®, which is the most well known brand of solid surface, comes in numerous colors and can be customized to fit your particular design as one piece, including the backsplash and sink, if desired. Any seams are very inconspicuous, giving Corian® countertops a clean one-piece appearance. One reason Corian® is so popular is that it is so easy to clean. It is nonporous, so it’s virtually impossible for stains to penetrate the surface. This is one reason Corian® countertops are certified for food contact. As long as it is cleaned properly, Corian® also resists the growth of mold and mildew. Another reason Corian® is so popular is because of the wide variety of innovative colors! This allows you to find the perfect color and pattern specifically for your room. This is one reason Corian® is a favorite among interior designers. 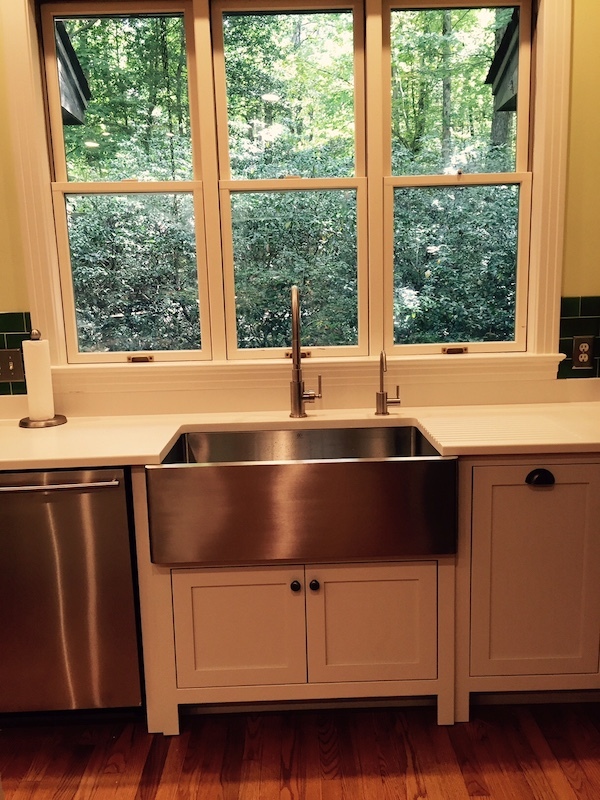 Corian® countertops also come with a warranty that natural stone countertops do not offer. Considering the wear and tear most counter tops are subjected to, a warranty on a countertop is impressive. The appearance of Corian® is unmatched in the countertop business. 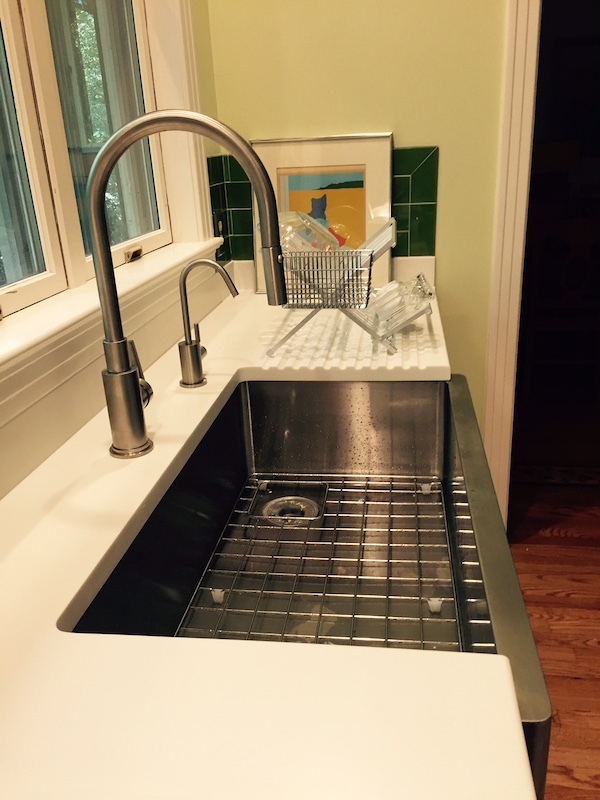 What makes Corian® different from other countertops is that they utilize a single-pour design. Add in the fact that Corian® can be engineered to mimic the appearance of natural stone, such as granite, the only thing that will give away the fact that it is Corian® is that the seams are very inconspicuous. Single-pour design. This aspect of Corian® really sets these countertops apart from all the rest. Corian® products such as sinks and backsplashes can be perfectly integrated to create the illusion of a single, solid surface. With a cove-backsplash there are no cracks to collect dirt and moisture. Even sinks can be a part of the top. This generates a look and feel unmatched by any other type of countertop. This is one reason Corian® countertops are so popular. No dirt and grime can get in any cracks between the sink and countertop because there aren’t any! It is exceedingly easy to simply wipe spill sand crumbs into the sink, since there is no ridge getting in the way. Remember though, Corian® is not natural stone and can scratch. It is not generally recommended to cut food on countertop anyways and instead you should use a cutting board. Dark colors are particularly susceptible to showing scratches in all solid surface materials. If your Corian® countertop does happen to get scratched, light scratches can be easily fixed using a special cleaning pad. You can get instructions from Dupont on how to remove scratches from a Corian® countertop. If your scratching is more extensive or you would just prefer a professional to bring your Corian® countertop back to a like new appearance, contact Atlantic Countertops for Corian countertop repairs. Also, since Corian® is not natural stone, it can scorch and burn when hot pans are placed on them. We recommend that you use trivets and heating pads on Corian® countertops. The color used in Corian® countertops penetrates the entire thickness of the countertop so they will not fade like other countertop products. Corian® is available in matte, gloss or semi-gloss finishes.